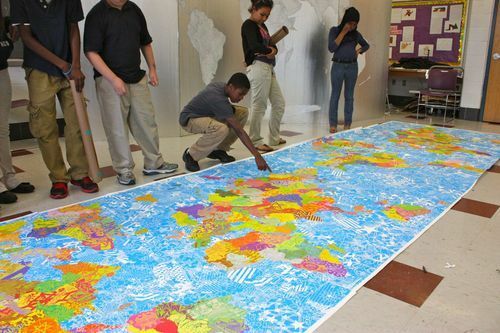 Students examining Tectonic Quilt, which they help to create with artist Ben Volta. Becalmed in Philadelphia enroute to ISSRM, a highlight of my airport layover has been some time spent with the so-called Tectonic Quilt, an ink-on-paper public artwork collectively created by Ben Volta and local fifth grade students. The artists used country boundaries filled with abstracted national symbols and colours as overlapping puzzle pieces to reconstruct the continental shapes most of us find familiar. A close look causes consternation – are those watersheds? – and then surprise – is that New Zealand where Japan should be? Finally, however, it challenges this Geographer’s self-conception of familiarity with the globe. Plucked from their context, the shapes lose meaning. I think the students are suggesting perhaps our national differences should, too. I could take objection to the stars and stripes forming the ‘ocean’, connecting it all, but I think their heart is in the right place. There could be a wink here towards the notoriously poor knowledge of world geography of US citizens, especially youth. Frankly, I’m not feeling much more geographically literate, today. I couldn’t find Canada – maybe it was overlooked?